La Belle Époque, the beautiful era, so deemed by those who lived and recalled it, occurred at the turn of the 20th century, when rapid and dramatic changes in capitalism and technology fostered a culture of exalted extravagance. Haute couturiers of the period designed gowns that made women sparkle as brilliantly as the electric lights that beckoned the bourgeoisie through the night streets of Paris. All art, attention, and wealth seemed dedicated to the pursuit of beauty and thrill. Although Diana Vreeland (1903-1989) was only a child during this period, her allegiance to the Belle Époque was life-long and expressed through her exhibitions with The Costume Institute of The Metropolitan Museum of Art. 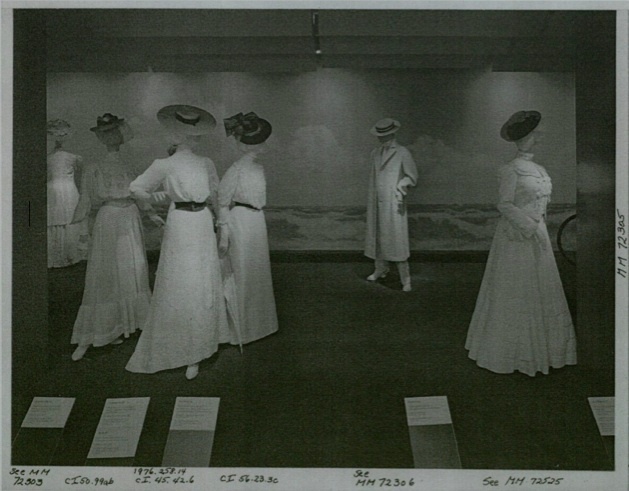 An examination of the 1983 exhibition La Belle Époque (1890-1914) will illustrate how Vreeland was concerned less with exhibiting historic costume but with honoring her memory of the era. 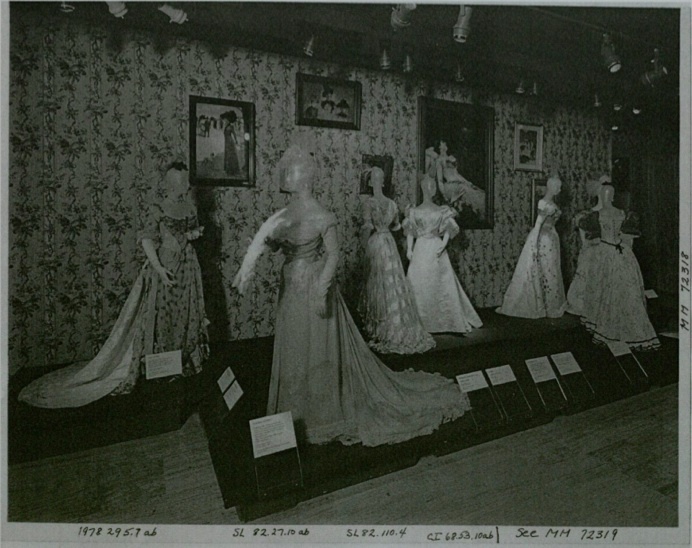 A portrait of Diana with costumed mannequins before the installation of the exhibition La Belle Époque (1890-1914), 1982. Photograph by Patrick Demarchelier. La Belle Époque (1890-1914) began its extensive nine-month run in the galleries at the Costume Institute of The Metropolitan Museum of Art on December 6, 1982. The exhibition checklist listed Stella Blum as Curator with Diana Vreeland as Special Consultant who “conceived and organized” the exhibition. 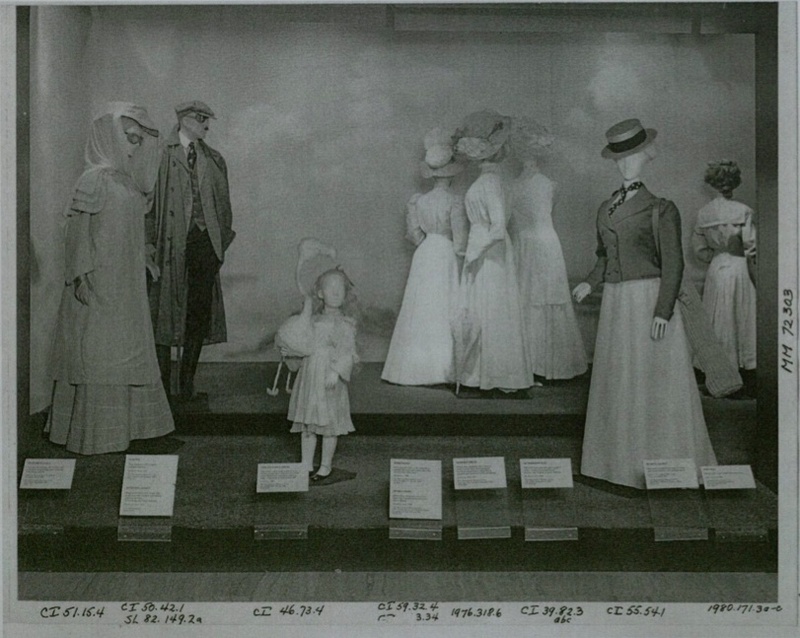 The exhibition consisted of eight separate spaces and exhibited one hundred-fifty dressed mannequins, over three hundred objects in total. While nothing can compete with experiencing the exhibition first-hand, the checklist and installation photographs provide a sense of Vreeland’s grand vision. In addition to what is visible and listed, the exhibition also included accompanying music and its own perfume “l’Heure Bleue” by Guerlain. Vreeland spared no expense and made use of painted backdrops, floral wallpapers, custom-made accessories, potted plants, and dog figures for a fully immersive experience. A summer scene from the “Newport/Bois de Boulogne” gallery, 1982. 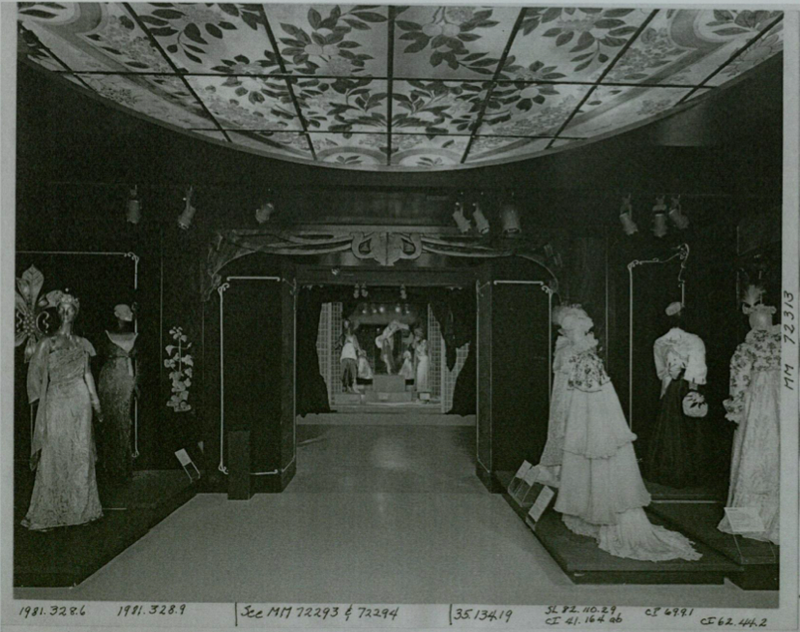 A view of the “Floral Wallpaper Gallery,” 1982. In the midst of preparing for La Belle Époque (1890-1914), her penultimate exhibition, Vreeland began writing her memoirs with editor George Plimpton. Born in 1903, she claimed she spent her childhood years surrounded by the cultural elite of the period. She described how Paris gave birth to and enriched her love of fashion. You don’t get born in Paris to forget about clothes for a minute. And what clothes I saw in the Bois! I realize now I saw the whole beginning of our century there. Everything was new. While she did have first-hand experience of the period, she was only a child. Yet according to Plimpton “whenever she talked about someone she gave the most accurate descriptions of what that person was wearing.” Still fashion for Vreeland was more than just clothes but lifestyle, charisma and inner-strength as well. For La Belle Époque (1890-1914) Vreeland was less dedicated to the garments themselves but to the personalities that wore them. She managed to track the fur coat that Proust wore summer and winter to a Paris storage, where it had been wadded up and nearly forgotten, only to be told that if it were to be exhibited, its first appearance probably should be in France. 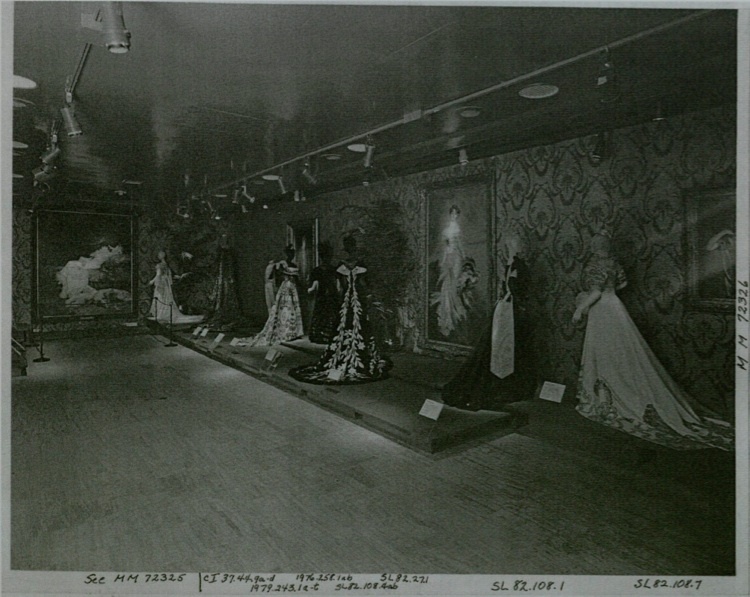 But Mrs. Vreeland has persevered, clinging to her worn copy of “Swann’s Way,” and she expects to have 150 costumes, including dresses that belonged to Queen Alexandra of Britain, Sarah Bernhardt, Eleanora Duse and the Countess Greffulhe, one of several of the more conspicuous consumers upon whom Proust drew for his fictional Duchess de Guermantes. Vreeland did work her contacts and requested over one hundred-thirty objects to borrow, although the majority of the requests were for jewelry, accessories and posters. Of the forty-three articles of clothing included in her requests, the majority came from the Brooklyn Museum, the Musée de la Mode et du Costume, and from private costume collector Umberto Tirelli. While many were worn by famous society, not every garment was necessary in representing a period in history. Vreeland stayed loyal to her memories of the glamorous people of her youth as she curated her exhibition. A view of “Small Maxim’s Gallery,” 1982. The New York Magazine’s dishy article described in detail Vreeland’s notoriety within the Costume Institute and the MET for being fluent in fashion but ignorant in history. She did honor the fashionable silhouettes of the period but did not let historical details dictate her decisions. The accurate dressing of the mannequins was probably due to vigilant museum preparators. Clearly visible in her portrait seen at the beginning of the post, was her abstracting of the exhibition’s mannequins with different colors and textures and by “veiling” them with stockings or net. These treatments distanced the costumes from their roles as historic representations and elevated them to dramatic objects of art. A view of “Blue Gallery/Vitrine,” 1982. For her larger gallery treatments Vreeland kept faithful to her available primary sources, which outside of her memories included fashion plates, fashion photography, and paintings from the era. Her use of painted landscapes in the “Newport/Bois de Boulogne” gallery mimicked fashion photographs of women in promenade as well as the painted backdrops used in many fashion portraits published in Les Modes. 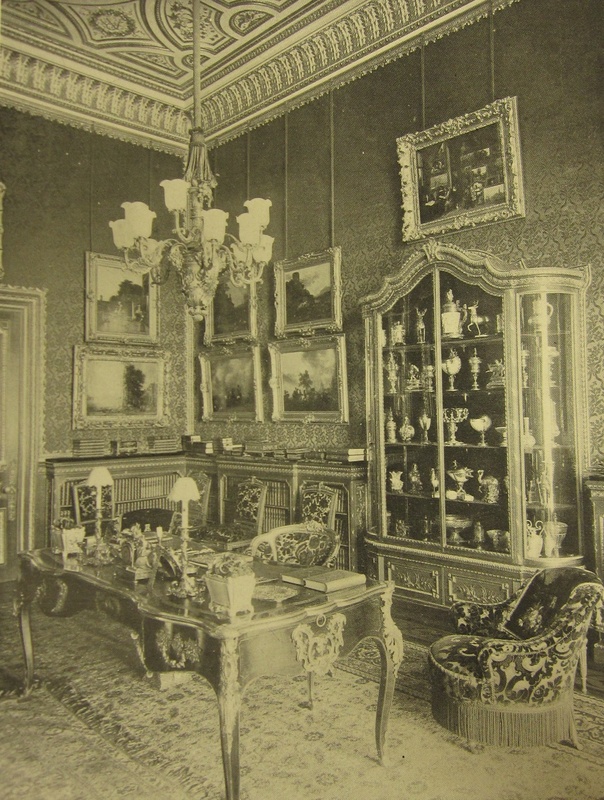 Her inclusion of graphic floral wallpaper, gilt frames and potted plants emulated the elaborate interiors she may have visited as a child. 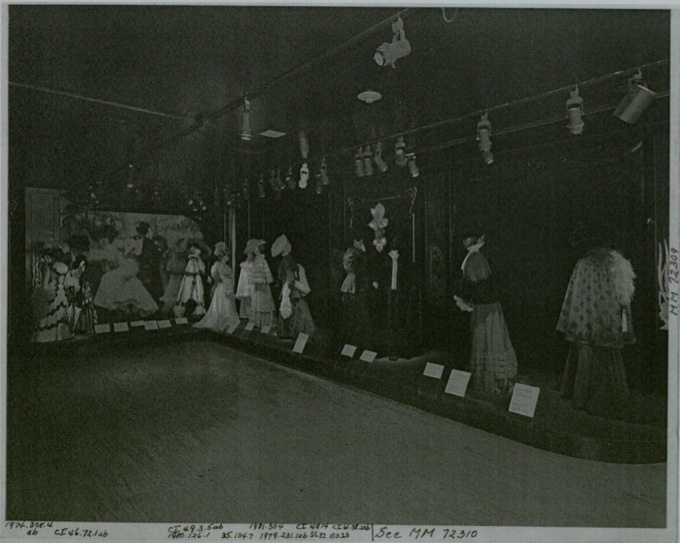 Interestingly her treatment of the gallery “Blue Gallery/Vitrine,” which exhibited 1912-1914 fashions, was less developed. This lack in detail again relates how La Belle Époque (1890-1914) was based on Vreeland’s personal story. By 1914 she left Paris with her family for the United States to evade World War I.
Vreeland worked to create plot and character in her galleries. She relied on the paintings that hung throughout the exhibition to represent the lives lived during the Belle Époque and the people and personalities she aimed to conjure. They provided the exhibition with another dimension of drama, gesture, and human engagement. The street photographs of Edward Linley Sambourne, although not a resource available to her then, probably depicted a version of Belle Époque fashion closest to Vreeland’s vision. Vreeland’s descriptions of life by the Bois de Boulogne brought to mind whirlwinds of movement and vitality. 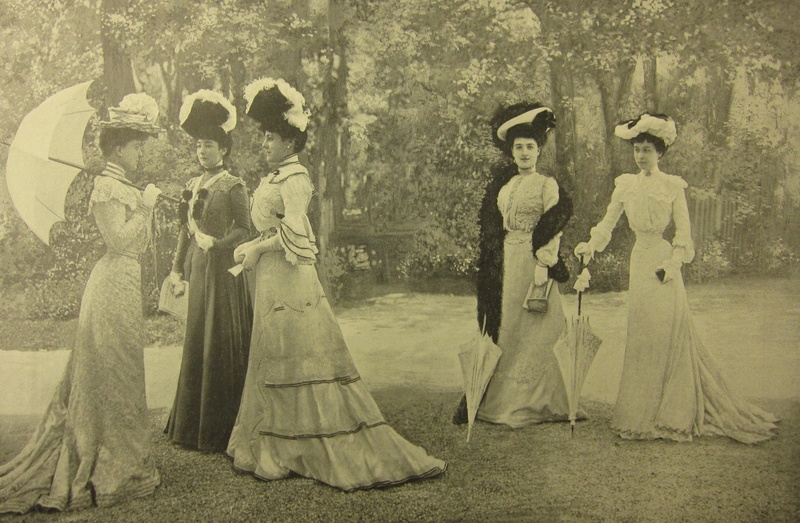 Unlike the women in fashion plates and photographs who stood stiff and rigid, the women in Sambourne’s photographs walked erect but brisk and engaged with each other. Vreeland attempted to replicate these human qualities and instill her galleries with movement by editing the mannequins, their postures, and their proximity to each other. One of her more engaging scenarios in “Newport/Bois de Boulogne” depicted a woman in a motoring coat considering a child carrying a flamingo and trailed by her caretaker. The three women in back were in the process of turning around and seem huddled in conservation. She arranged the mannequins in close groups to suggest these human moments, unconcerned that these placements prevented visitors from seeing the costumes. 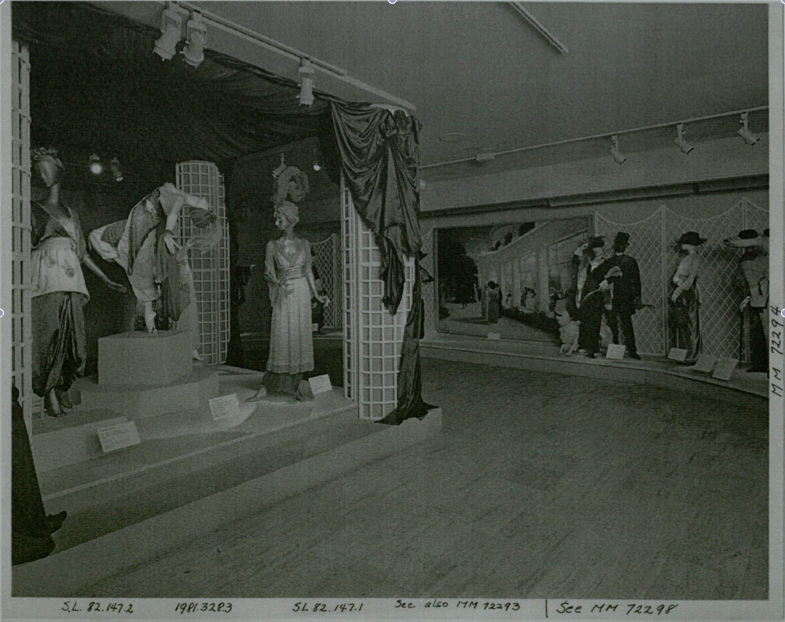 By placing the mannequins on low platforms and in gallery-large vignettes, Vreeland forced visitors to be active participants and relate to the mannequins as well. Vreeland was acutely aware that she presented a subjective version of the Belle Époque. The young girl holding the flamingo symbolized herself as a child and “her own world of childhood, ill remembered but nonetheless vivid in reflection.” By alluding to Lewis Carroll’s character Alice, she whimsically alerted viewers to the fantasy incorporated into this exhibition of historic costumes. Vreeland understood the power in negating the barrier between fashion and reality, and while she was not the first to bring spectacle to the galleries at The Metropolitan Museum of Art, her work resuscitated public interest in the Costume Institute. Vreeland’s legacy and influence has been evident in fashion exhibitions held by the MET’s Costume Institute within the recent years. Her La Belle Époque (1890-1914) marks a change in the treatment of costume in exhibition, when costumes are no longer mere representations of a period in history but mediums in fulfilling a curator’s vision. Please come back next week, as Janet continues to examine how other exhibitions at the MET’s Costume Institute have exhibited the fashions of La Belle Époque. 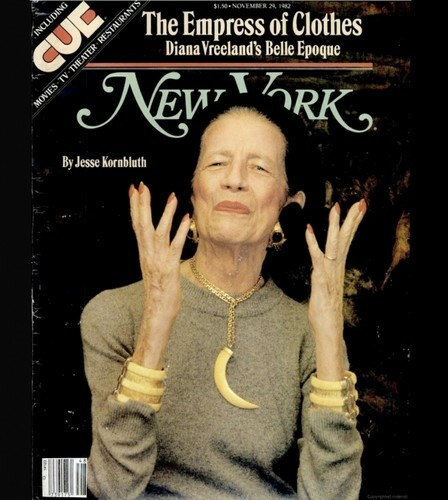 Jesse Kornbluth, “The Empress of Clothes,” New York Magazine 15, no. 47 (November 29, 1982). http://books.google.com (accessed December 16, 2012). Paul M. Ettesvold, La Belle Époque, Exhibition Checklist (New York: Metropolitan Museum of Art, 1983), 23. John Duka, “La Belle Europe Reigns Again a Met Museum,” New York Times (December 7, 1982). www.nytimes.com (accessed December 16, 2012). Diana Vreeland, D.V., eds. George Plimpton and Christopher Hemphill (New York: Alfred A. Knopf, 1984), 13. 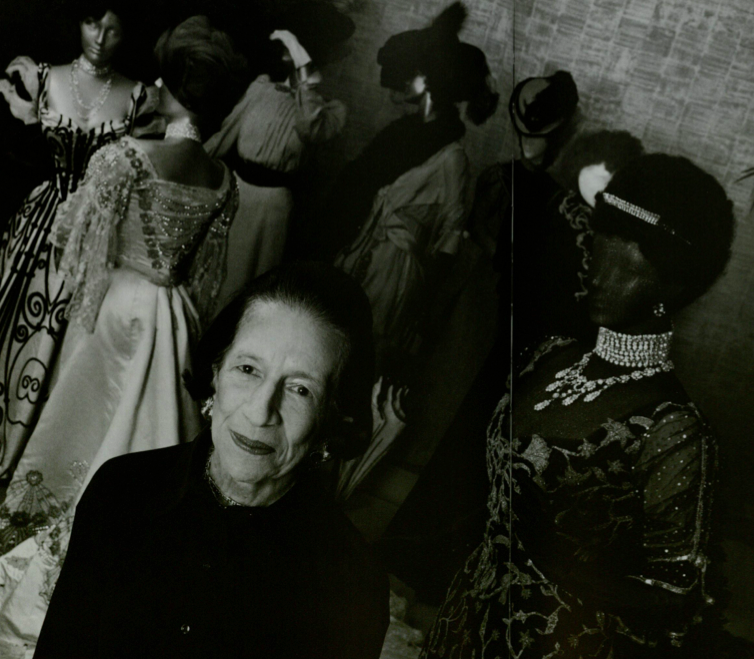 Eleanor Dwight, Diana Vreeland (New York: Harper Design, 2011). Charlotte Curtis, “Diana Vreeland’s Way,” New York Times” (September 14, 1982). www.nytimes.com (accessed December 16, 2012). Richard Martin and Harold Koda, Diana Vreeland: Immoderate Style, (New York: Metropolitan Museum of Art, 1993), 25. This entry was posted in Exhibition, Research and tagged Diana Vreeland, exhibition design, Harold Koda, History of Costume, History of Fashion, La Belle Epoque, MET, The Costume Institute. Bookmark the permalink.